I’ve been talking about The Lean Startup, which is all about cheap experiments to find value. My last post was on the new book, “Lean Analytics“, and how it focuses primarily on web-based startups — but there was at least one idea that applies to every business, every team, even every person. If you wanted a simple guide to map out your career, or the future of your department, this is it. Take, for example, the looming shadow of outsourcing, or offshoring. If you take the twenty minutes to analyze your department’s partners, key activities, cost structure, customer relationships, and so on, along with your potential competition, you can figure out what advantages your team can offer against outsourcing … and what to look out for. Don’t worry, it gets easier. Now this is something I can actually get behind. Let’s take a look. Problems: What problems do your customers have, that you (or your team, or department), solve? Solution: How do you solve it? Key Metrics: How will you know that your are successful? I’ll have a lot more to say about metrics theory. For now, let’s say that metrics that are not valid are dangerous – and even valid metrics can cause dysfunction. For example, at Apple in the 1990’s, there was a common sales practice called “channel stuffing”, by which sales executives, under pressure to meet quarterly sales goals, sold computers to companies in the last days of the quarter with full knowledge those companies would return the computers a week later using the 30-day return policy. The story is not mine; Gil Amelio, the former CEO of Apple computer, documents it in his book On The Firing Line. Notice something about those stories, though: They often involve an attempt by a subordinate to “game” a metric invented by a decision maker. For our purposes, on this canvas, we are decision makers, and also possibly working in the system. So my first piece of advice with metrics is be careful not to fool yourself. At the very least, the hope is that our measures for success make it harder to fool ourselves, not easier. Value Proposition: Why should people come to us and not the competition? Channels: How do we get our solutions to our customer? “Email, phone, and walking to the customer” might be a perfectly valid answer. If the competition can’t be on-site, then we have an unfair advantage. Customer Segments: Can we split up our customers in some way, so that what we provide can be different (and differently priced) between customer groups? This allows us to focus on the most profitable/valuable customers, or the segment of the market that has the most opportunity for growth. Cost Structure: What does it cost per month to run our organization? Per year? Why? How can we change that? For example: Two employees that move to part-time can save the company money if they offer to share a desk, or the company might save office space in a move to an open plan environment. (Want to move to private offices? I can respect that — use the canvas as a framework to explain why that is better. I put the questions above in the shape of a IT team, but they don’t have to be. You could use them to analyze your family, your startup, your company, or your own career. Once you have a canvas done, you can use it to communicate with others about what your team does and how it adds value to the business. Here’s one last thing to think about. You might say “but Matt, I’m not a manager!” and that’s fine, but let me ask: If you went through this exercise, took it to your manager, and now he can have that better conversation with his manager, how much value have you added to his work life? How much have you contributed to your team? 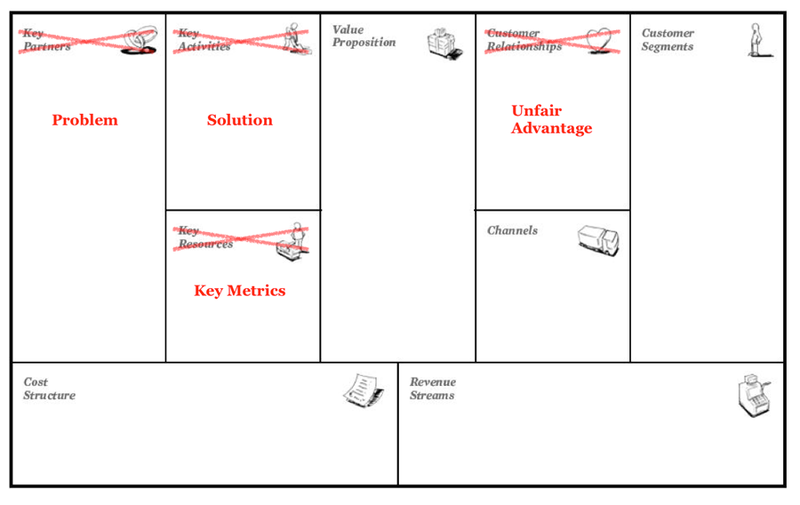 Print the lean canvas on paper and take the twenty minutes to fill it out well. There is more infomation here; you can even spent the twenty dollars to create the canvas online. I can’t promise that it will be a good use of your time, but giving it a try? I suspect it’s worth doing a cheap experiment.